I’m approaching the end of the first week of the Handstand challenge. I was incorrect in where I thought the difficulty would lie. Getting into position when you are facing the wall is easier than back to the wall. Arm and back strength is decent. Your core is where the key is. 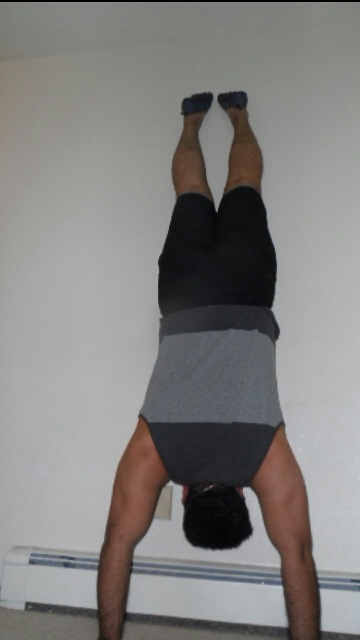 When you are in a handstand you are essentially doing a vertical plank. Which means core and glutes flexed. So where my difficulty lies is when attempting to hold the handstand for 5 minutes is keeping those abs tight. I end up breaking the 5 minutes into 30-45 intervals. Go up. Hold it. Come down. Gather myself go up again and repeat until I hear that beautiful alarm sound.